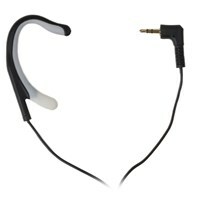 This NoiZfree Telecoil Hearing Aid Compatible Monaural Ear Hook is specifically for use with most audio devices. This audio listening device accessory features Telecoil technology is a widely used standard in hearing aids that enable users to collect sounds from special sources and fields, canceling environmental background noise. The NoiZfree Audio Monaural Earhook is a lightweight series of hands-free and audio-phones for telecoil compatible hearing aids, placed behind the ear. Simply switch the hearing aid to T-function (or MT in some devices) and place the ear-hook on the ear. Four different types provide different options to users to enjoy noise-free use of audio sources (HiFi, portable walkman, cd players, mp3 players, etc. ).